They say Germany’s two greatest contributions to Western Civilization were the Reformation and hops in beer. And both happened at about the same time. As condensed history, so it goes. But hops also radically impacted pottery history. Everybody wanted beer once early 16th century brewers, village housewives mostly, began producing it. Kids even got their diluted “little beer” for breakfast. And the best beer containers, before mass produced glass, were stoneware bottles. Demand skyrocketed. Germans had been tinkering with stoneware since the 10th century. 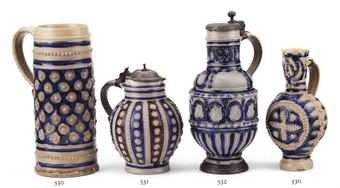 But 16th to 18th century salt-fired German stoneware became world renowned because of beer. Unfortunately Germany’s Rhineland district, where the best work was made, was a playground of war for centuries. 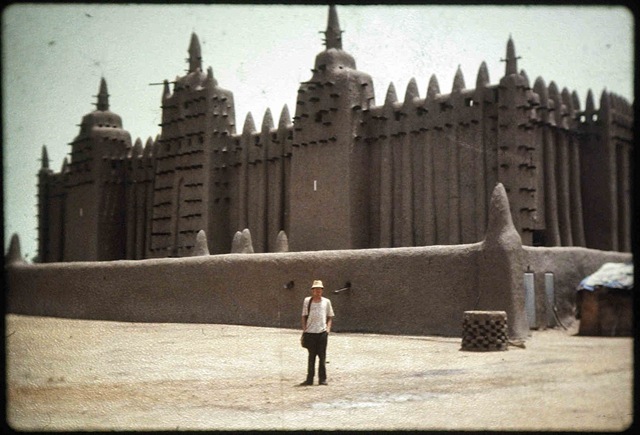 Whole communities were continually uprooted by chronic warfare. Rhennish potters from Raeren, Freshcen and Siegburg ultimately ended up in the somewhat calmer Westerwald region. Along the way they picked up improvements in clays, sprig decorations, and brilliant manganese and cobalt highlights. Their work spawned off-shoots, reproductions, fakes and revivals long after their dominance had passed. Tons of German stoneware, literally, were shipped to England’s North American colonies during the 18th century. Ironically beer bottles and beer mugs, “krugen” and “cannen,” were not the top imports. Chamber pots were. But drinking vessels were close behind. And they were scattered almost as far. Colonists weren’t the only admirers of salt-fired German stoneware, however. Many Native American burial sites included Westerwald jugs. When pottery is done well, there are no boundaries to how far it will be collected. Stoneware in America. Robert Hunter, ed. Stoneware: White Salt-Glazed, Rhenish and Dry Body. Gérard Gusset. National Historic Parks and Sites Branch, Parks Canada, Environment Canada/Ministry of the Environment, Ottawa, Canada. 1980. Chamber pots elicit more interest from historians than almost any other pottery type. Maybe it’s just that “potty humor” is so hard to resist, even for professionals. Historians and especially archeologists would counter that chamber pots provide excellent dating of sites. Entire chronologies of occupation can be built on the progression of chamber pot styles found at any given location. Of course, Chinese export porcelain and local production season the mix. For me, though, the most powerful emotion that chamber pots elicit is sadness. I think of the most tragic pot I’ve ever come across. It’s an ironstone chamber pot. White, plain, no frills or decorations. Machine molded probably just before 1912. By itself, there would be nothing remarkable about this chamber pot. Except it’s location. It is sitting perfectly upright on the floor of the Atlantic ocean. It’s last, and quite probably only user was a passenger on the ill fated RMS Titanic. Ceramics in America. Quimby, Ian, Ed. University Press of Virginia/Charlottesville. 1972. The Concise Encyclopedia of Continental Pottery and Porcelain. Reginald Haggar. Hawthorn Books/New York. 1960. If These Pots Could Talk. Ivor Noël Hume. University Press of New England/Hanover, NH. 2001. North Devon Pottery and its Export to America in the 17th Century. C. Malcolm Watkins. Smithsonian Inst./Wash DC. 1960. Clay in the Hands of the Potter, An exhibition of pottery manufacture in the Rochester and Genesee Valley Region c. 1793-1900. Rochester Museum and Science Center. 1974. You are currently browsing the archives for the Westerwald category.